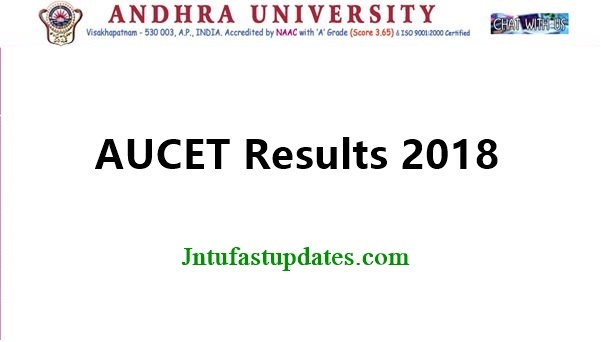 AUCET Results 2018: Andhra University CET 2018 Results & AUEET Results are declared at www.andhrauniversity.edu.in/ doa or www.audoa.in. Candidates can check their AUCET Result 2018 and download AUCET Rank Card 2018 from the official website of Andhra University. Directorate of Admissions, Andhra University, Visakhapatnam invites applications from eligible candidates for admission through Andhra University Common Entrance Test (AUCET)-2018 into various Science, Arts, Engineering and Law Courses offered in Campus Colleges of Andhra University (AU), Visakhapatnam, P.G. Centres, and Colleges affiliated to AU offering P.G. Courses for the academic year 2018-2019. 2. Candidates who have already passed their qualifying degree examination or who have appeared / are appearing for the final examination in 2017 only are eligible for AUCET-2017. Candidates qualified in advanced supplementary examinations of 2018 are also eligible. The entrance test conducted in Offline mode as a Paper-Pen Based Test. The paper will consist of 100 objective type and Multiple choice questions in 2 & 1/2 hours duration. Each question has four options out of which one is correct. Each correct answer will awarded 1 mark. The unanswered questions or multiple answers will receive nil marks. No negative marks. Andhra University Post Graduate Common Entrance Test is state level qualifying examination for admission to various PG courses. Every year AU conducts AUCET exam for Degree holders. In similar manner AU University has conducted 2018 test on 13th May 2018. All the candidates who are interested have applied for this AU PGCET and participate in the entrance test, check their results through official link. Result indicates the following information. How to Get AUCET 2018 Results Online? Entry’s are correct result along with marks, rank will be displayed. Save it, download it and print a copy. All candidates appeared for the Entrance Test will be awarded AUCET-2018 test-wise Ranks as per marks secured in the test appeared. In case of a tie between candidates securing the same mark in a test, the order of merit will be decided on the basis of date of birth of the candidate with priority to older candidate. Candidate has to download Rank Card from the website only. There is no provision for revaluation or personal verification of the answer sheet. 1.2 How to Get AUCET 2018 Results Online?